Mercury enters Pisces (February 10 – April 17) causing the general focus of news, media, and communications to revolve around issues of our beliefs, spiritual growth, cultural expression, arts and music as well as destructive tendencies such as escape and drug use. Mercury in Pisces brings out the mystic in all of us and adds quite a bit of imaginative color and flare to our communication style. First Quarter Moon in Taurus (February 12) emphasizes practicality. The fixed earth nature of Taurus leads many to feel inclined towards creature comforts. Meanwhile, many people are watching their funds and making sure they’re getting the most value possible out of their expenditures. However tight the pocketbook may be, let the beauty of our surroundings be accented and appreciated. Mars enters Taurus (February 14 – March 31). Mars represents all modes of action. In the fixed earth sign of Taurus, Mars’ action is keenly affected through the physical realms, making this a primary time to work active energy through the body, or convert affirmative action in the physical world into a state of change. 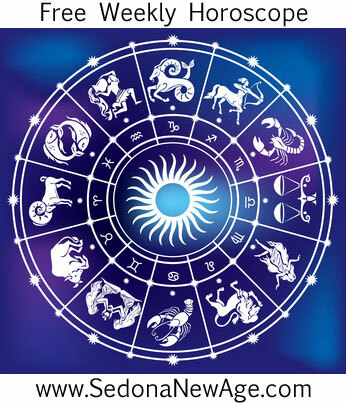 Mars in Taurus brings out a focus on Taurus related activities such as bargain hunting, buying and selling, investing, decorating and creating a practical work space. Aries: The path of independence may be calling you, and this is certainly a good time for forging ahead – on your own if necessary – to do whatever you feel is important. It is unlikely that you will be truly alone, for the Sun’s journey through your social zone suggests that you have people around you who are supportive in your aims, but still, there may be one or two things that you have to do single-handedly. Perhaps the challenge this week is to strike a balance between autonomy and togetherness. Whatever you can do and share with others, do so. Whatever you have to do alone, do it. You can learn a lot about yourself this week by daring to be different and treading the un-trodden path, so make it your mission not to stick in your comfort zone. If you push out into uncharted territory, you will be rewarded. Taurus: Are you heading in the right direction? Do you feel as though you’re fulfilling your purpose? If the answer is no or not quite, use this week to make the necessary tweaks and alterations to help get yourself to where you need to be. Taurus folk can sometimes get stuck in habits and patterns or feel that even if the grass is greener over the hill, it might be too much effort to get there. Don’t let comfort, complacency or laziness stop you from getting to where you want to be. A little effort this week will pay dividends further down the line, and you might just find yourself in a field far lusher than the one you’ve been making do with. Gemini: This week, you could lose your sense of perspective or feel like a spinning top. The best antidote to this is to ground yourself, preferably in nature. However, even just visualizing roots coming out through your feet and anchoring you into the earth will have a stabilizing effect. Life is bound to be busy. Your social life, for example, could be a whirlwind, or you might decide to explore new territory, which could leave you feeling the need for a firmer foundation. None of this will last long, so it might be a case of enjoying it while you can. Just remember to ground yourself from time to time; otherwise, you could find yourself floating off! Cancer: The transformation theme continues this week, so examine your life to assess what can stay and what needs to go. If you would benefit from rejuvenation, then a session with a healer or therapist could enable you to feel better about yourself. The aim is to leave some troubling aspect of yourself or your life behind. By February 12 and the First Quarter Moon, you will have some sort of progress, when it feels as though constructive developments are taking place. Leo: While there may be considerable demands on your time and energy, the Sun’s journey through your zone of others reminds you that your greatest source of well-being right now lies in your relationships. Simply spending time with people you like will be a tonic, helping you to feel more positive about any difficulties you are experiencing. Meanwhile, Jupiter in your fun zone reminds you that the point of life is to enjoy it so reactivate an old hobby or discover a new one. Fall in love with something or someone. Invite more color and spontaneity into your life. Don’t think it always has to be about rigid rules and tight schedules. Make space in your daily life for things you enjoy, and your zest for life will soon return. Virgo: Organization and careful planning are at the root of success. We only have to look at the lives of people who live chaotically to see how a life without order results in failure. The Sun’s journey through your zone of work and efficiency is calling you to streamline your life in such a way that everything begins to work beautifully. This could mean sorting out your paperwork, getting up and going to bed at the same times each day, eating regular meals or taking breaks between busyness. Assess how you function, and try to spot where you would benefit from being more organized and efficient or where you could implement routines that would support you in accomplishing tasks. Libra: When we look at people’s lives today, we see a mass of frantic complexity – information overload in an exceedingly fast pace, too many choices, and a dependence on technology. The simplicity of life in the old days is well and truly gone. As the Sun journeys through your house of fun, you might be longing for a more carefree existence or certainly one with more heart-centered enjoyment. It could help to scrub a few things off your to-do list by doing something enjoyable. If you feel down, lack enthusiasm, or need motivation, it’s probably because your spirits need to be lifted. The best way to do that is to do more of what you enjoy and a little less of what feels like a drudge. Scorpio: Your advice this week is to expect the unexpected, as your ruler Mars joins Uranus to create a melting pot of excitement. Notice “excitement” rather than “chaos,” because if you channel the energies of this dynamic duo correctly, you could be in for a rather thrilling week. The arena of work and your service or your day-to-day life is perhaps the area in which you can expect to see developments, and your health may potentially suffer from a little too much activity. If you can find spaces to rest during the activity, you will fare better. It’s also a good week to try an alternative treatment, since the energies favor anything that’s a little different, whether that applies to your work, your health, or your life in general. Marching to your own drumbeat is the way to go. Sagittarius: Although you might be keen to forge your own path and march to your own drumbeat, there is also a lot to be said for acceptance, especially of those situations you can’t change. The trick to navigating this week successfully is to assert your right to be you and express yourself in whatever way feels appropriate while accepting things as they are. This might sound like a contradiction, but it is likely that in some aspect of your life, you are seeking growth and change, but the universe might have a better idea of how that change and growth should come about so watch out for synchronicities, openings and opportunities. The door that opens without your having to push and shove is the right door to step through. Capricorn: The Sun’s journey through your financial zone makes this an opportune time to sort out your material life, whether it’s your work or the need to generate more cash. Possessions can also be featured at this time in the sense that you might make a purchase or become more involved with or attached to something you possess. Where we spend our money can show us what we value most and this is a good week to get clear about your values. Some people spend money on experiences, and others spend money on things or on other people. Now might be a good time to ask whether where your money goes is a good expression of what you really value and whether your values are still appropriate for you. Aquarius: As the Sun continues its journey through your sign, your strength, confidence and motivation for life should be growing. The only danger is that whereas previously you might have held back your thoughts and feelings, this week it’s unlikely you’ll be able to keep a lid on things. If you’re not mindful, this could result in a sharp manner or angry outburst. Cruel words will never win any favors, but if you can combine assertiveness with compassion, you will get much further. Seek to motivate others this week, and you may be surprised by the results. Pisces: Be mindful this week of what opportunities and blessings you have rather than focusing of what you lack. The Sun is reaching the end of its journey around your solar chart, and you too are reaching some kind of ending, even if it’s only a small kind of closure, such a letting go of something that no longer works for you or simply retreating from the hurly-burly of life for a little while to regenerate your body, mind and spirit. Don’t feel that you have to do anything right now other than make time to connect with your inner self, so when the new doors open you will be ready and willing to walk through them. Moon 29° Scorpio 21' 41"
Mercury 05° Aries 39' 24"
Venus 01° Aries 08' 40"